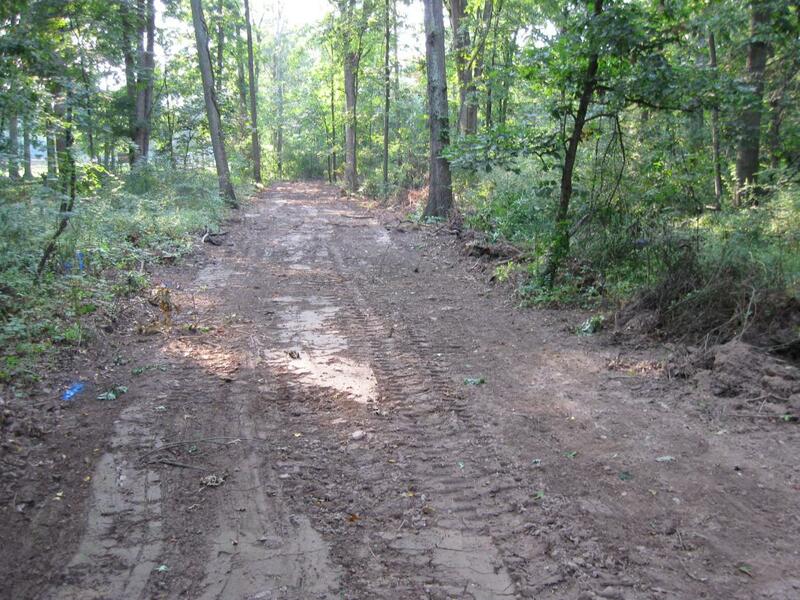 A pathway, 24 feet wide and 225 yards long has been cut through McMillan Woods to accomodate a water line to the McMillan Woods Campground. This view was taken facing west at approximately 5:30 PM on Wednesday, August 26, 2009. 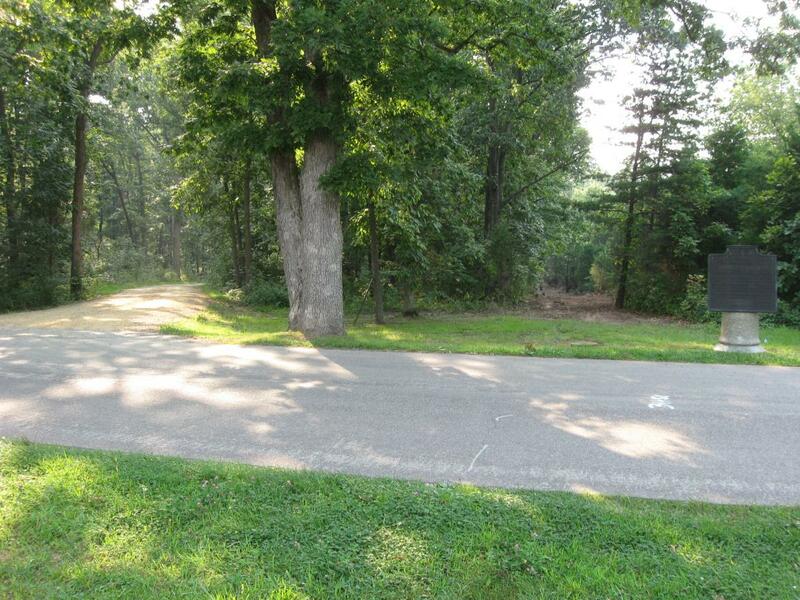 A water line is being constructed on Seminary Ridge west of West Confederate Avenue for $395,000. (National Park Service spokesperson Katie Lawhon later e-mailed us: “I had previously stated that it was a $395,000 project. That was just the initial project cost estimate and it is no longer an accurate number… The actual cost of the project is $281,247.” Therefore, the figures we quote later in the posts about the waterline should be decreased accordingly. The money is being provided by the American Recovery and Reinvestment Act, and is therefore, more “stimulus” money. One might think that the digging of the simple water line, should disturb the ground by a width of a foot or so. 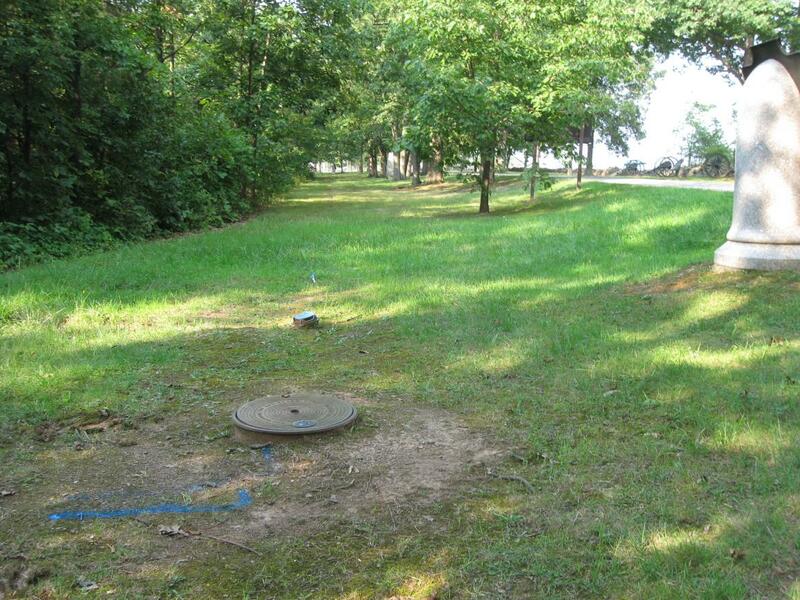 However, the ground is being altered in a 40 foot swath along West Confederate Avenue. 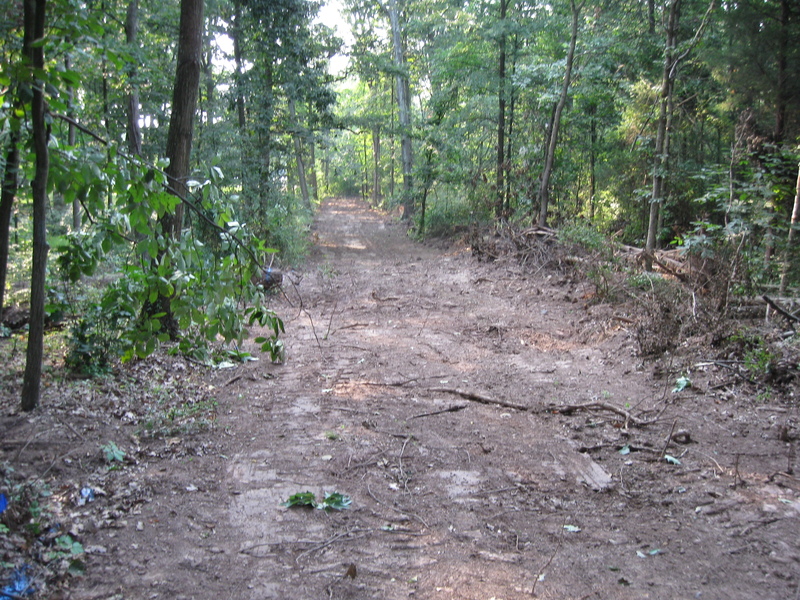 A 24 foot wide pathway has also been cut through McMillan Woods. 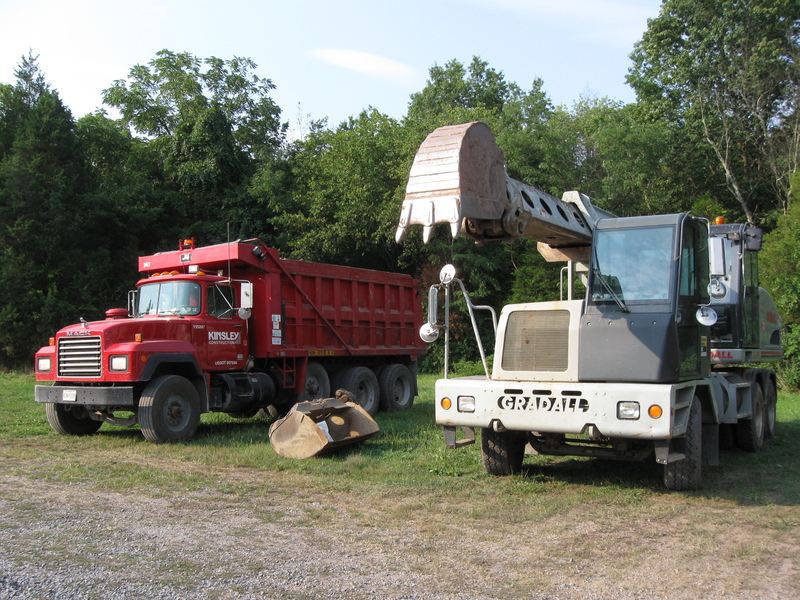 The project is due to be finished this fall. 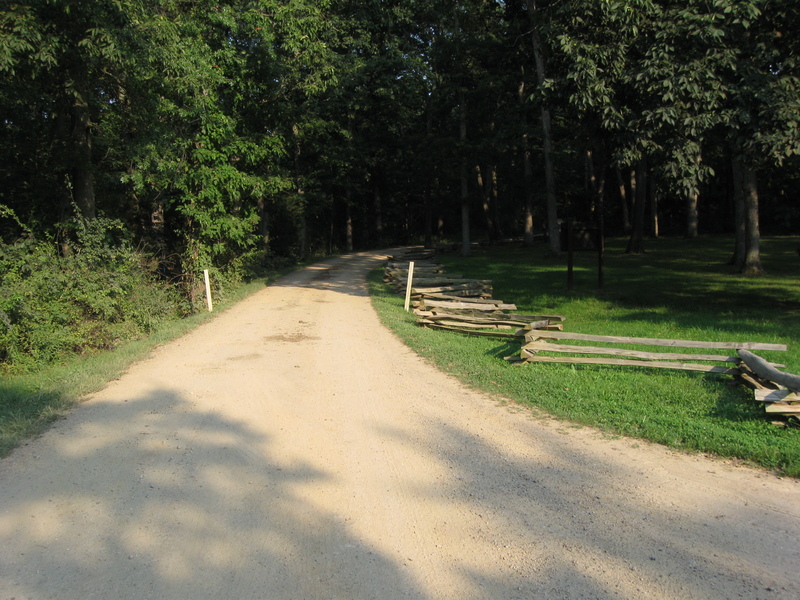 In part one, we saw the construction area from the Army of Northern Virginia Itinerary Tablets to the McMillan House. 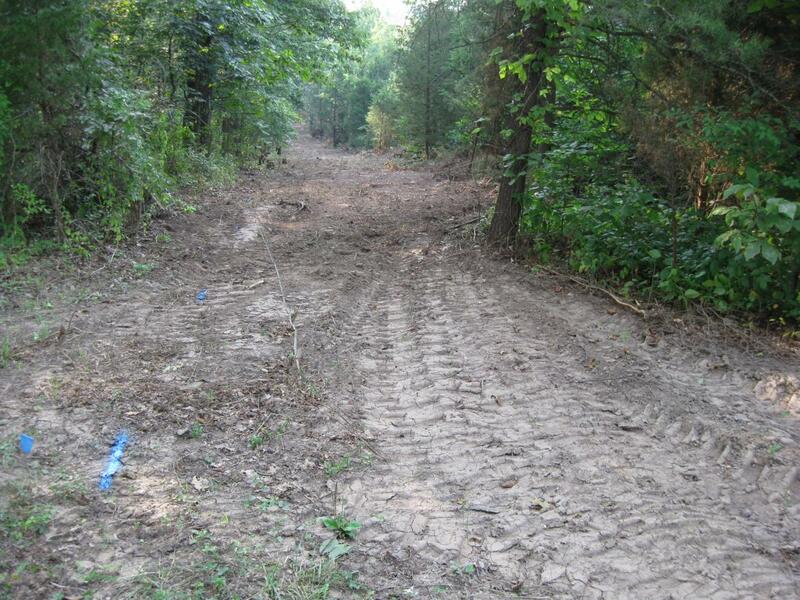 Today we show the progress of the waterline into McMillan Woods and the new path the size of a road that has been cut into the woods to accommodate it. 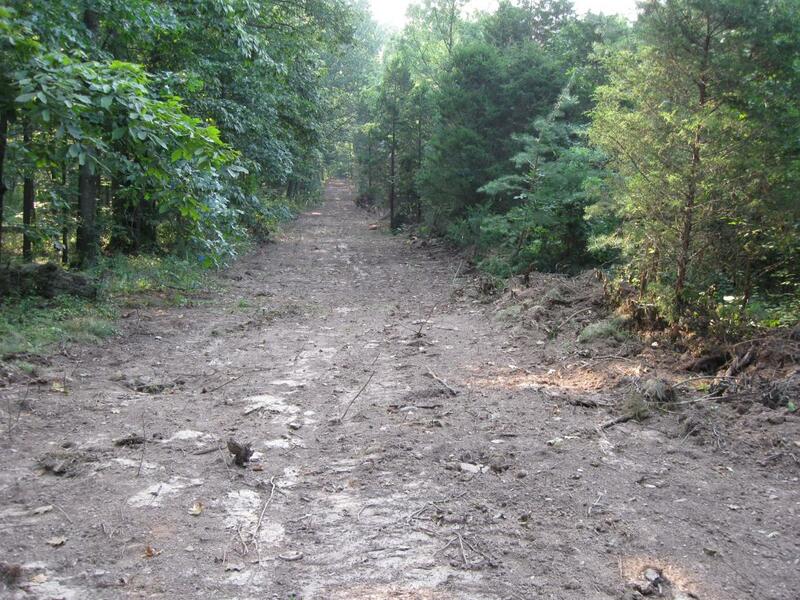 In our last post, we saw the water line coming down West Confederate Avenue on the left (west) side. This view was taken facing north at approximately 5:30 PM on Wednesday, August 26, 2009. 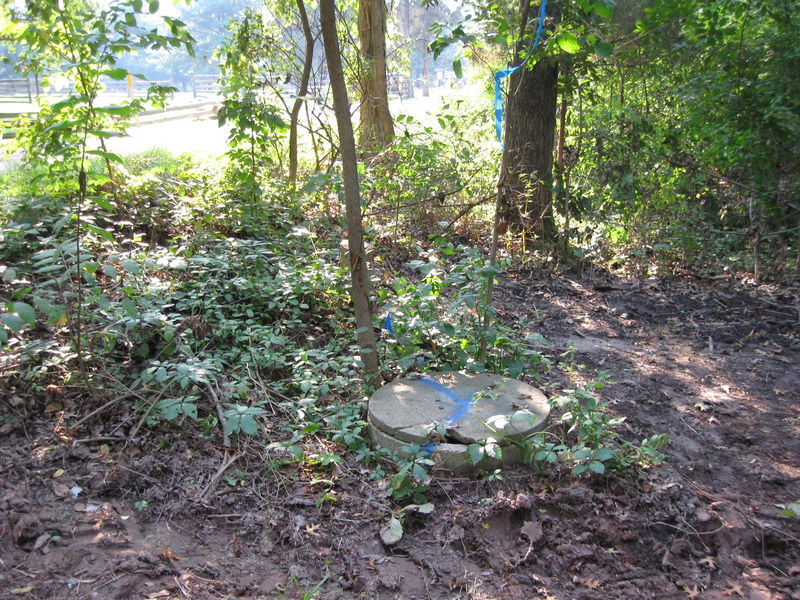 The water line, marked by the small blue flag, will not go into the woods at this point. 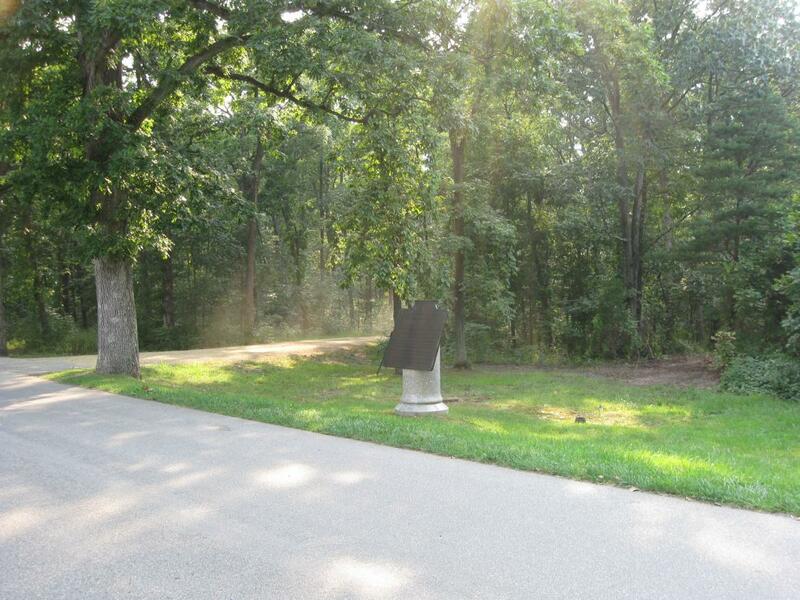 It will be located between the woods and West Confederate Avenue. This view was taken facing south at approximately 5:30 PM on Wednesday, August 26, 2009. 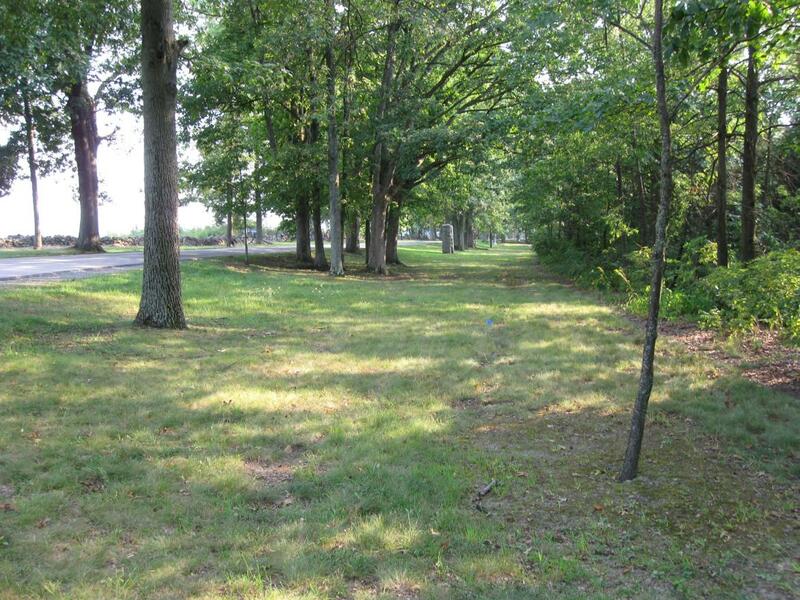 We can’t see how they can have a 40 foot long right of way for the water line in this area unless they cut down the trees on the right. This view was taken facing south at approximately 5:30 PM on Wednesday, August 26, 2009. 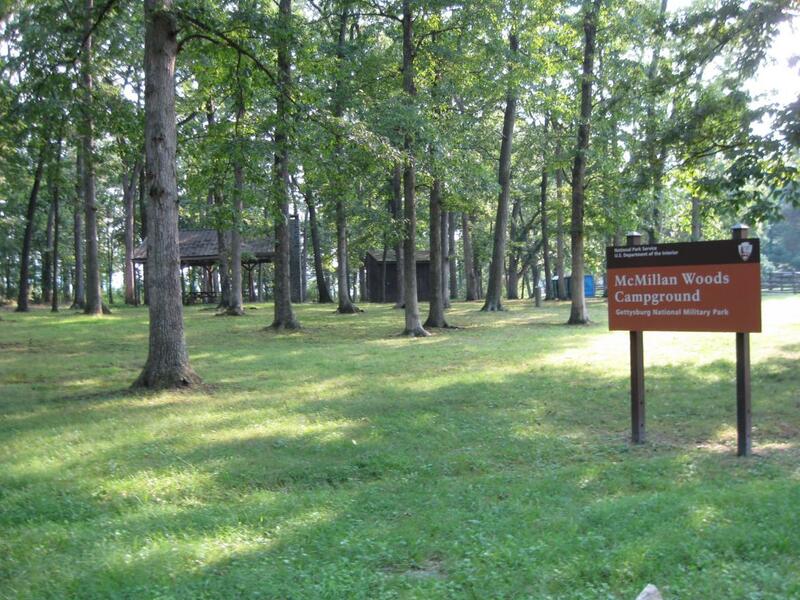 As we approach the entrance sign to the McMillan Woods Campground, we can see the dirt entrance road ahead. This view was taken facing south at approximately 5:30 PM on Wednesday, August 26, 2009. However, as we prepare to turn down the light colored dirt road to the campground, we noticed something on the right of this view. This view was taken facing southwest at approximately 5:30 PM on Wednesday, August 26, 2009. Instead of extending the water line another 33 feet from right to left (north to south) and taking the line down the existing dirt road on the left, they have decided to make a new pathway in the woods as shown on the right. This view was taken facing west at approximately 5:30 PM on Wednesday, August 26, 2009. 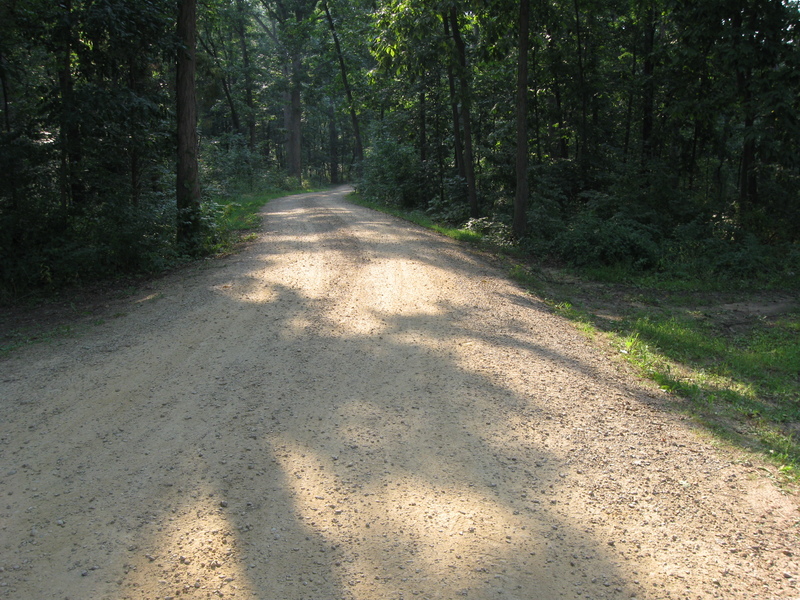 The current dirt road is approximately 24 feet wide. This photograph was taken facing west at approximately 5:30 PM on Wednesday, August 26, 2009. 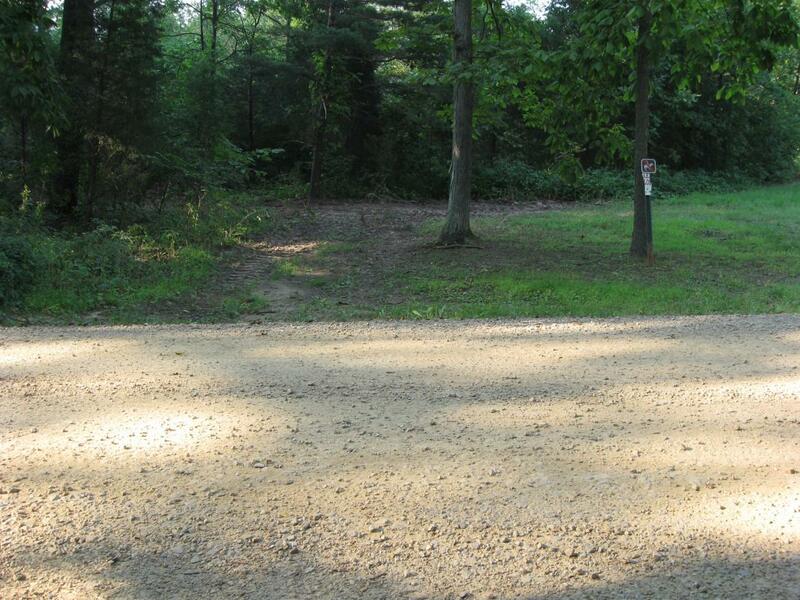 The new pathway is approximately 24 feet wide. This photograph was taken facing west at approximately 5:30 PM on Wednesday, August 26, 2009. Let’s look at this again in slow motion (ok this isn’t video, so we’re really just showing the turn to the woods from other angles). 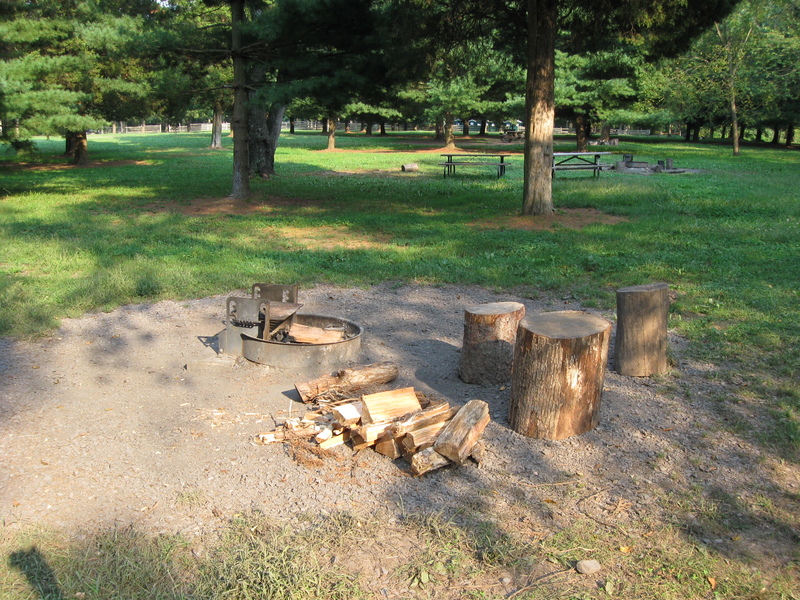 This photograph was taken facing north at approximately 5:30 PM on Wednesday, August 26, 2009. 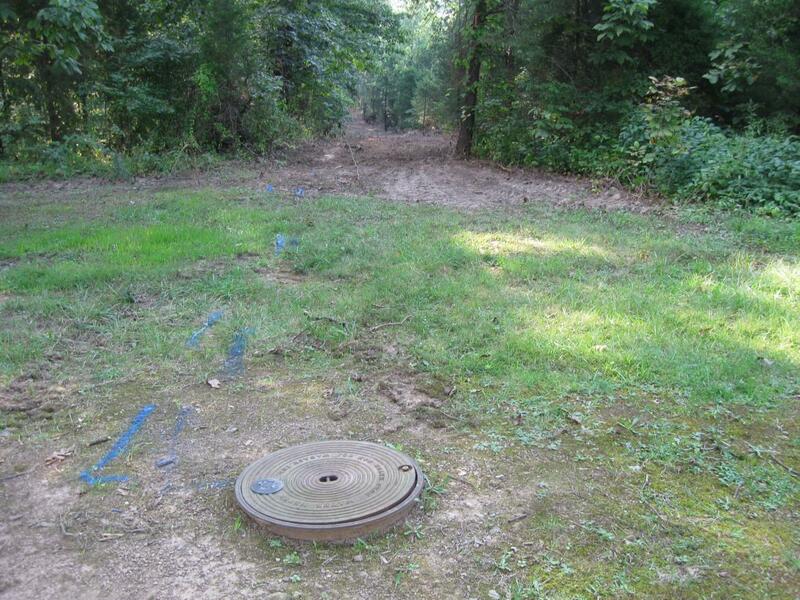 Remember, the blue spray painted lines mark the water line. This view was taken facing west at approximately 5:30 PM on Wednesday, August 26, 2009. It appears to be right on target. This view was taken facing west at approximately 5:30 PM on Tuesday, September 23, 2008. We’ll, of course, follow the newly created “path” of the water line. This view was taken facing west at approximately 5:30 PM on Wednesday, August 26, 2009. 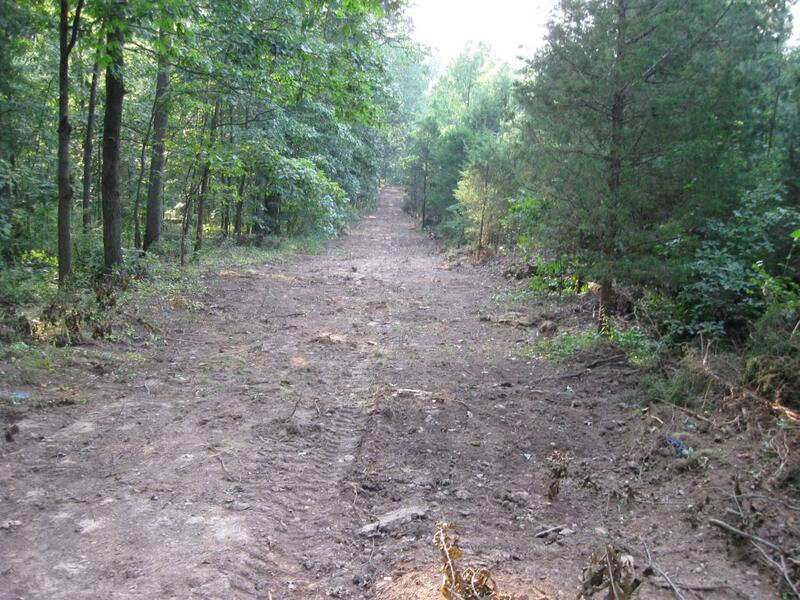 Please don’t tell us that a new path the size of a road had to be created through the woods so that the existing road wouldn’t be closed. 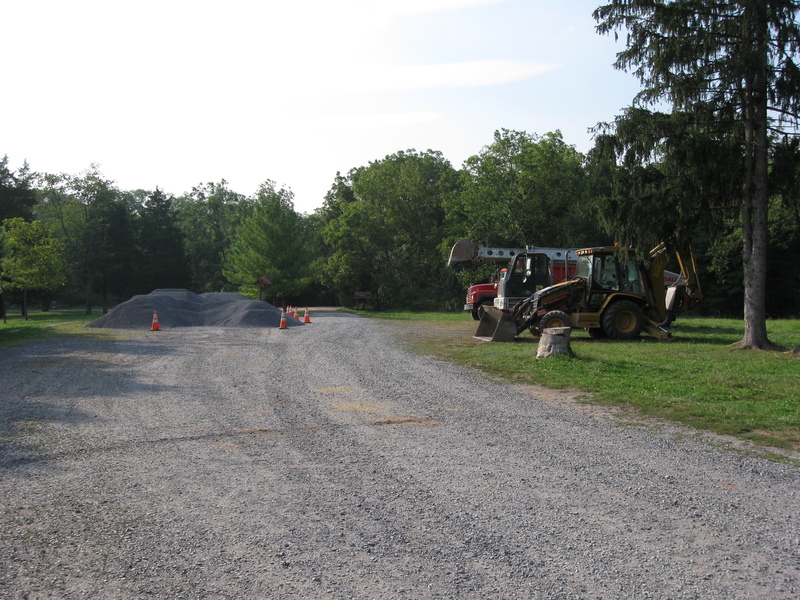 The contractors closed lots of other road in Gettysburg National Militarey Park this summer, and significantly inconvenienced visitors. This view was taken facing west at approximately 4:45 PM on Tuesday, May 5, 2009. 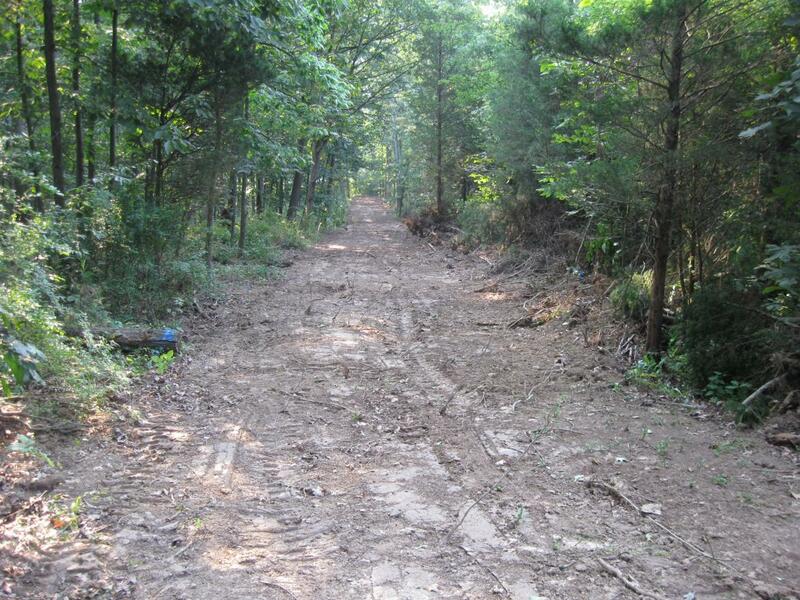 This new pathway roadway is 225 yards long. This view was taken facing west at approximately 5:30 PM on Wednesday, August 26, 2009. One of the many things that strike us with this tree clearing is that the markings for the water line are on the left side of this new road. Can you see the blue flag on the left side? This view was taken facing west at approximately 5:30 PM on Wednesday, August 26, 2009. 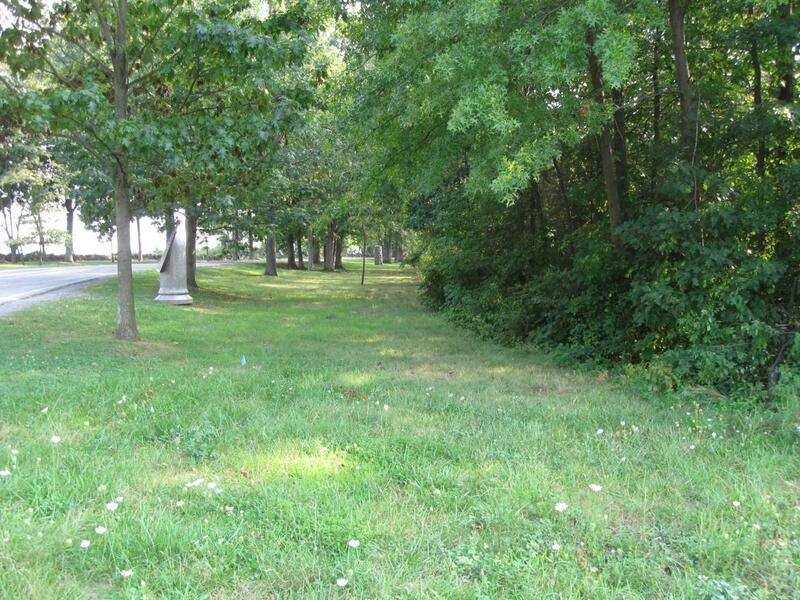 How about the blue markings going over the tree trunk on the left? This view was taken facing west at approximately 5:30 PM on Wednesday, August 26, 2009. Possibly the blue markings here don’t mean the same thing that they did on other parts of this project. This view was taken facing west at approximately 5:30 PM on Wednesday, August 26, 2009. But if they are placed for the same reasons, there is a lot of roadway on the right that appears to have been cleared for a reason unrelated to this water line. This view was taken facing west at approximately 5:30 PM on Wednesday, August 26, 2009. Did the contractors really have to impact the resource this much for a simple water line? This photograph was taken facing west at approximately 5:30 PM on Wednesday, August 26, 2009. Are there other reasons this road/path has been constructed… This view was taken facing west at approximately 4:45 PM on Tuesday, May 5, 2009. 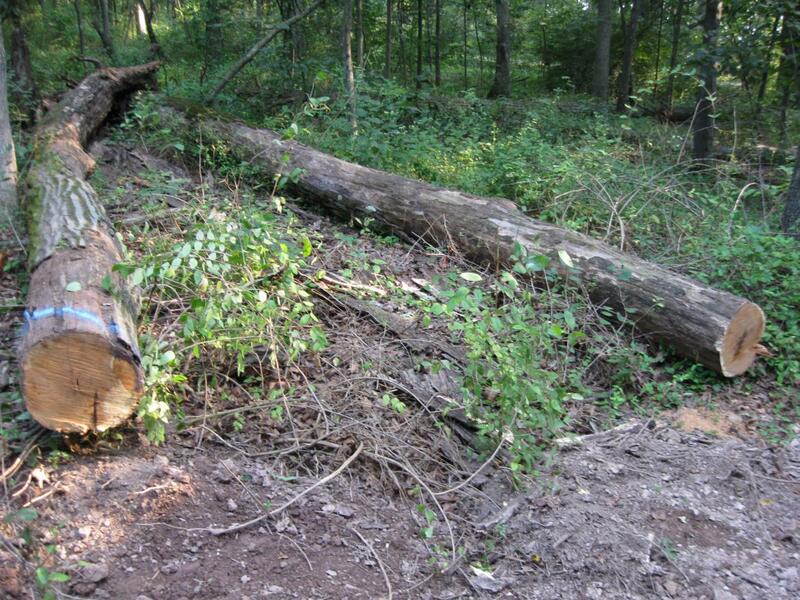 …and the trees have been cut down? This view was taken facing west at approximately 5:30 PM on Wednesday, August 26, 2009. We are now approaching the end of the road. This view was taken facing west at approximately 5:30 PM on Wednesday, August 26, 2009. 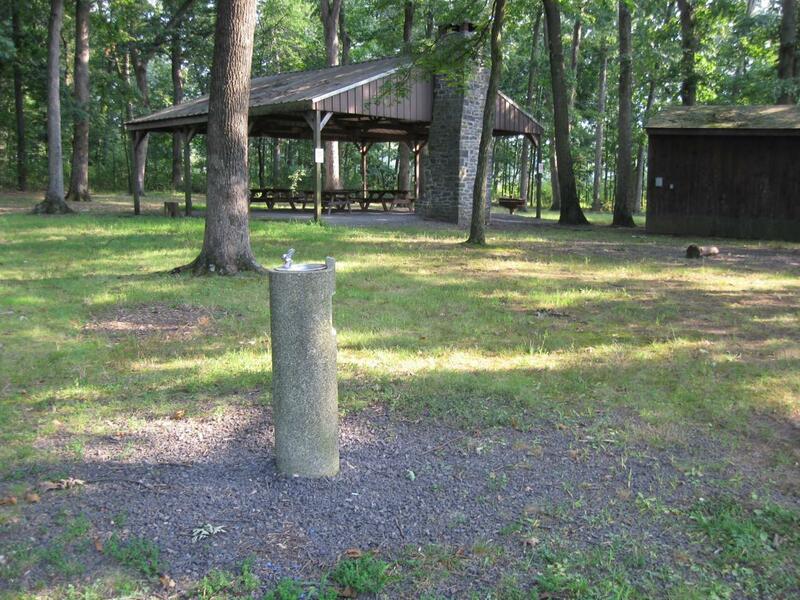 The water line is marked to the left of this stump. This view was taken facing west at approximately 5:30 PM on Wednesday, August 26, 2009. At this moment, the new road hasn’t been cleared to meet the current road. This view was taken facing southwest at approximately 5:30 PM on Wednesday, August 26, 2009. This is as far west as we go until we begin turning south. This view was taken facing southwest at approximately 5:30 PM on Wednesday, August 26, 2009. 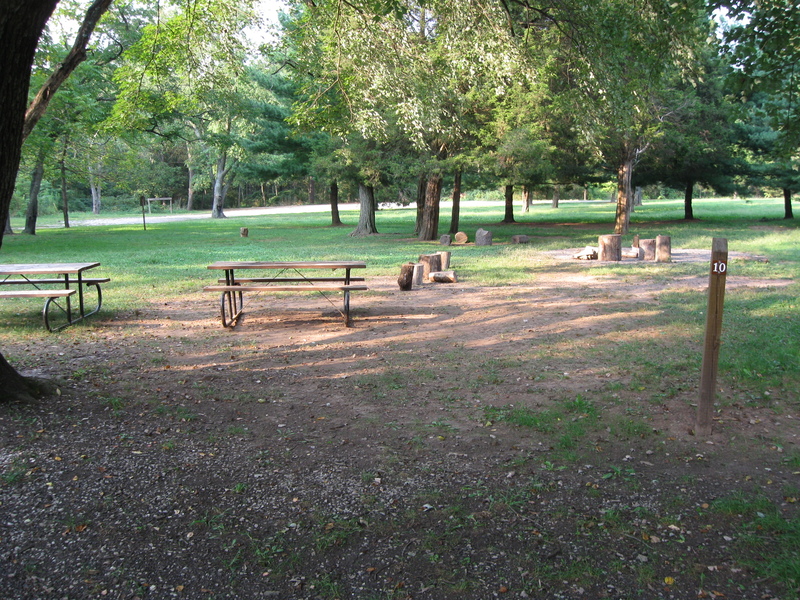 And now we’re moving into the campground. This view was taken facing southwest at approximately 5:30 PM on Wednesday, August 26, 2009. We’ll cross the current road at the spot where it tells us horses are not allowed on the current road. Hmmm. This view was taken facing north at approximately 5:30 PM on Wednesday, August 26, 2009. The water line will go underneath the road from right to left near the light colored posts. This view was taken facing east at approximately 5:30 PM on Wednesday, August 26, 2009. And here is what all the fuss is about. Here is what almost $400,000 gets the American people. This view was taken facing southeast at approximately 5:30 PM on Wednesday, August 26, 2009. The water line goes here to this one spigot (two faucets)… This view was taken facing southeast at approximately 5:30 PM on Wednesday, August 26, 2009. …and here. That’s it. 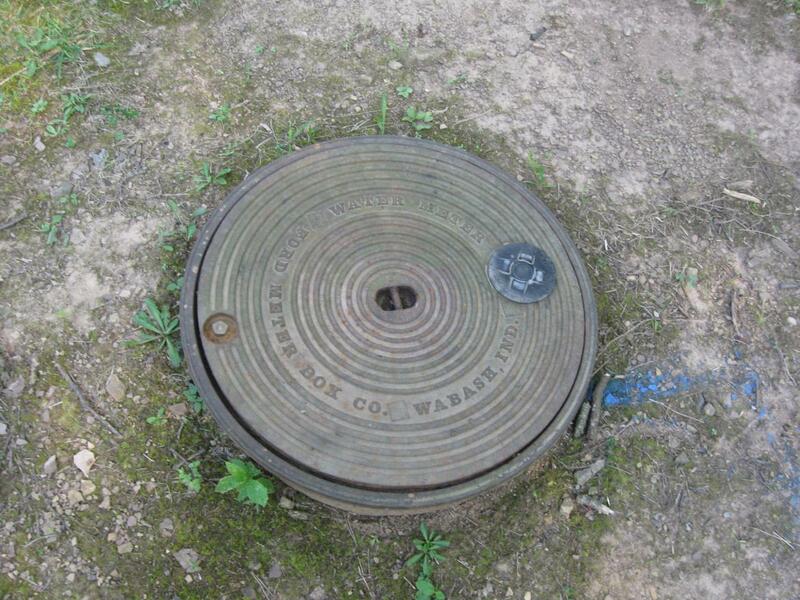 So the price comes to approximately $200,000 a spigot, or $133,000 a faucet. This view was taken facing southeast at approximately 5:30 PM on Wednesday, August 26, 2009. The water line will not be extended to these structures. This view was taken facing east at approximately 5:30 PM on Wednesday, August 26, 2009. 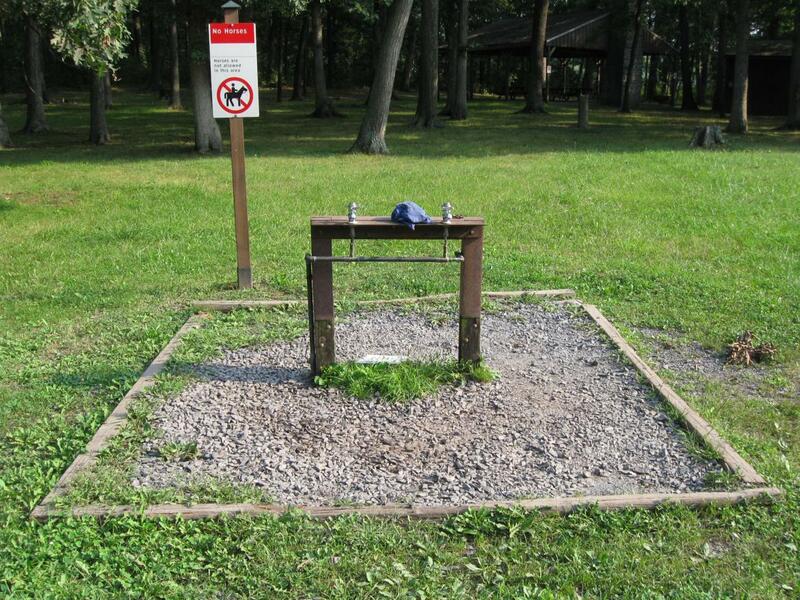 There are not restrooms with running water, and there will not be in the future. 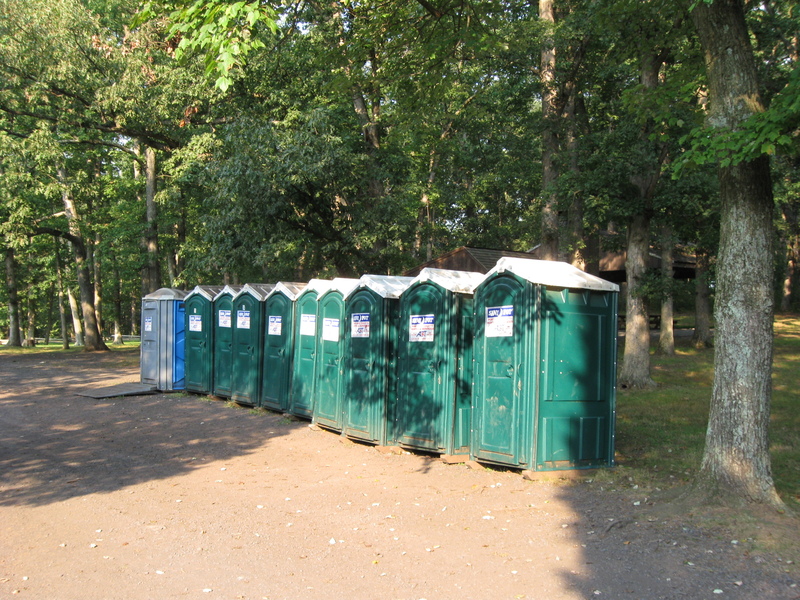 Just these 10 current Port O Potties. This view was taken facing northeast at approximately 5:30 PM on Wednesday, August 26, 2009. 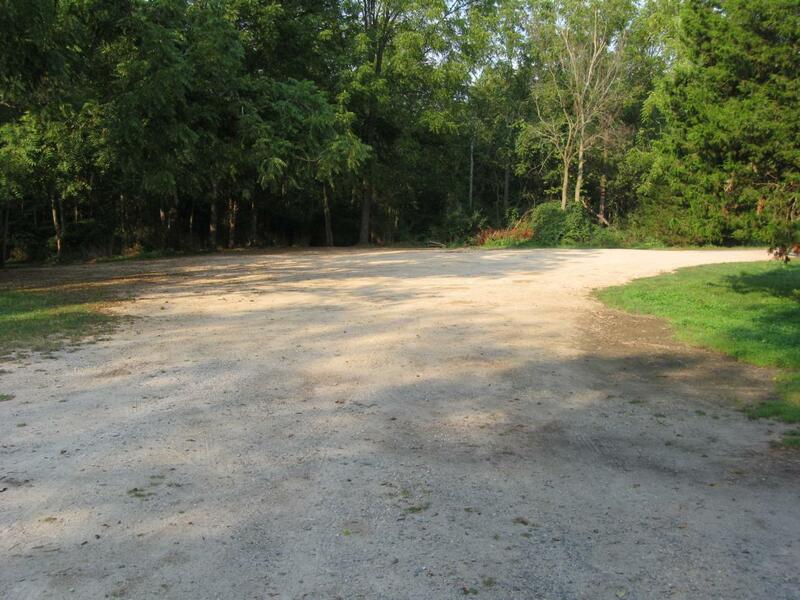 And the water lines won’t be taken into the camping areas. This view was taken facing northeast at approximately 5:30 PM on Wednesday, August 26, 2009. 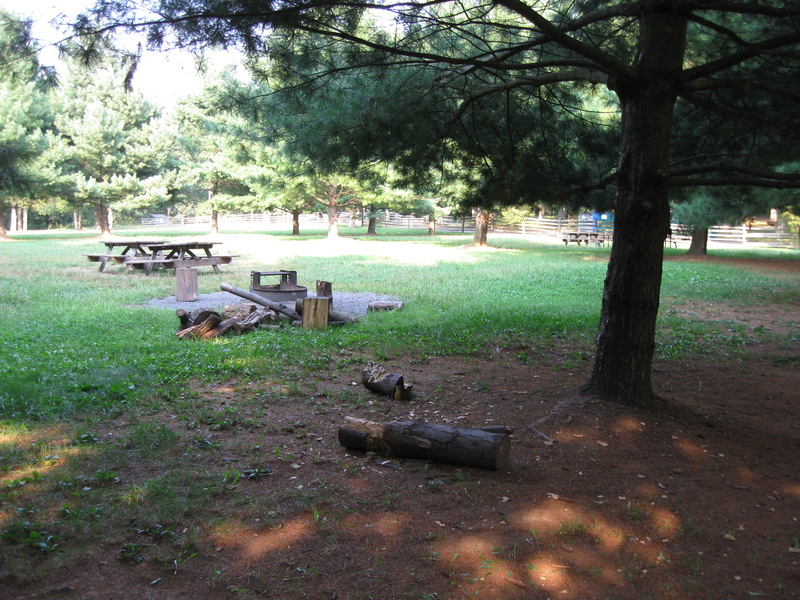 When we asked National Park Service Spokesperson Katie Lawhon if the water line will be expanded throughout the campground area, she replied, “Other than upgrades to the existing service, there are no new lines or hook-ups to be installed throughout the campground except we are putting a hose bib at the campground host site, as a convenience to future volunteer campground hosts.” This view was taken facing northeast at approximately 5:30 PM on Wednesday, August 26, 2009. 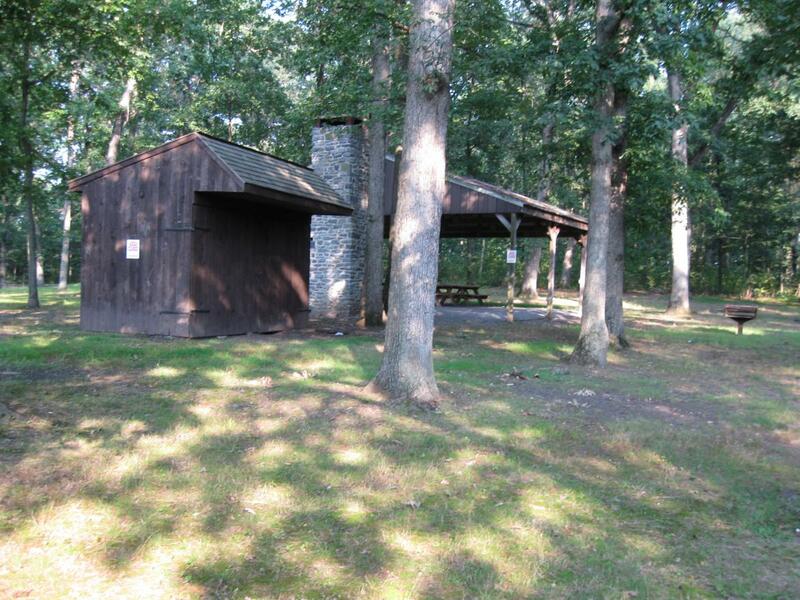 There are ten campsites for youth groups such as the Boy Scouts. This view was taken facing north at approximately 5:30 PM on Wednesday, August 26, 2009. So water is not being brought into the area where horses trailers are parked… This view was taken facing north at approximately 5:30 PM on Wednesday, August 26, 2009. 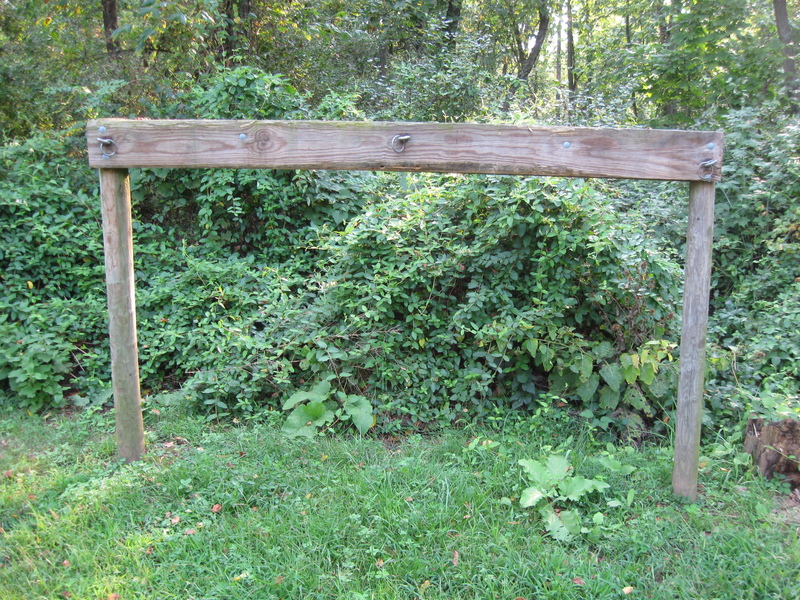 …or where the horses are hitched. This view was taken facing southwest at approximately 5:30 PM on Wednesday, August 26, 2009. The water line possibly is a necessary project. This view was taken facing west at approximately 5:30 PM on Wednesday, August 26, 2009. But could it have been completed in a simpler… This view was taken facing west at approximately 5:30 PM on Wednesday, August 26, 2009. …less intrusive manner? This view was taken facing northwest at approximately 5:30 PM on Wednesday, August 26, 2009. 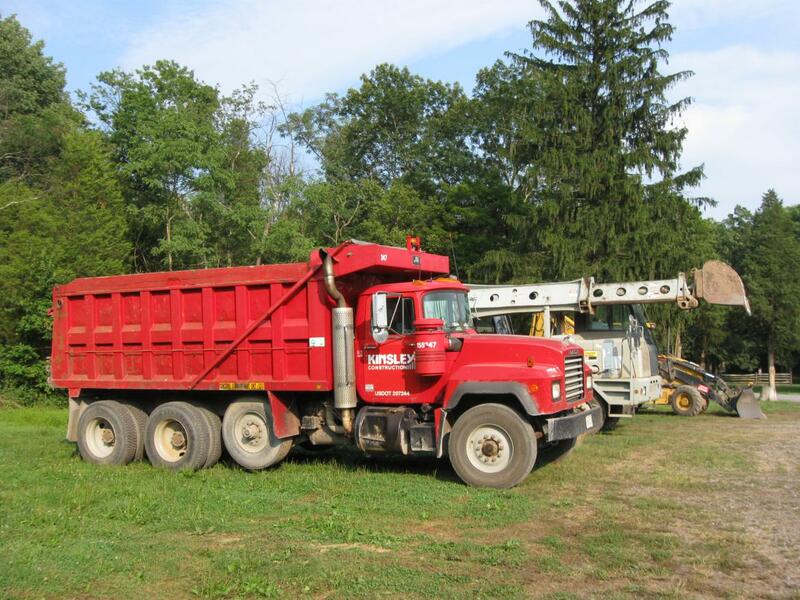 We are glad that the stimulus money puts people to work. This view was taken facing northeast at approximately 5:30 PM on Wednesday, August 26, 2009. But did this project really need to be to this scale? 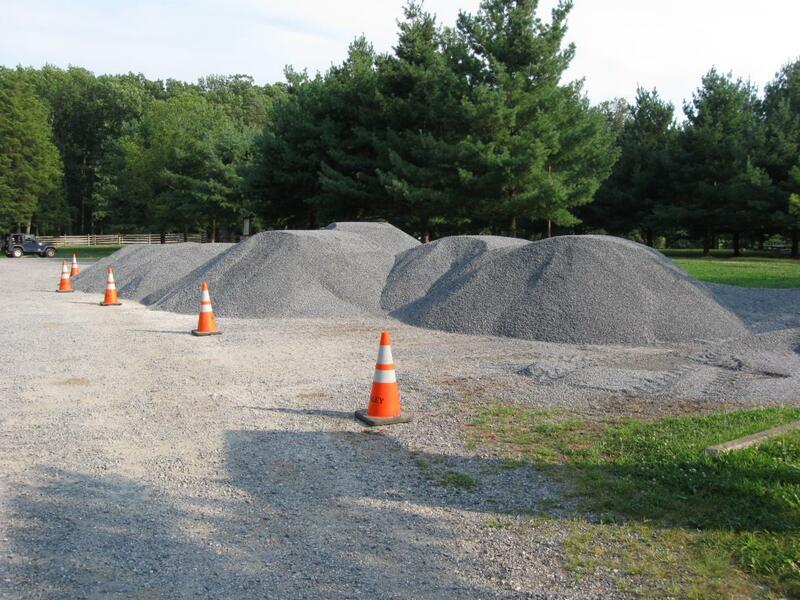 This construction significantly (and we believe needlessly) impacts the park in an area that before showed little disturbance. This view was taken facing east at approximately 5:30 PM on Wednesday, August 26, 2009. McMillan Woods Water Line Construction Part 1 on August 29, 2009. 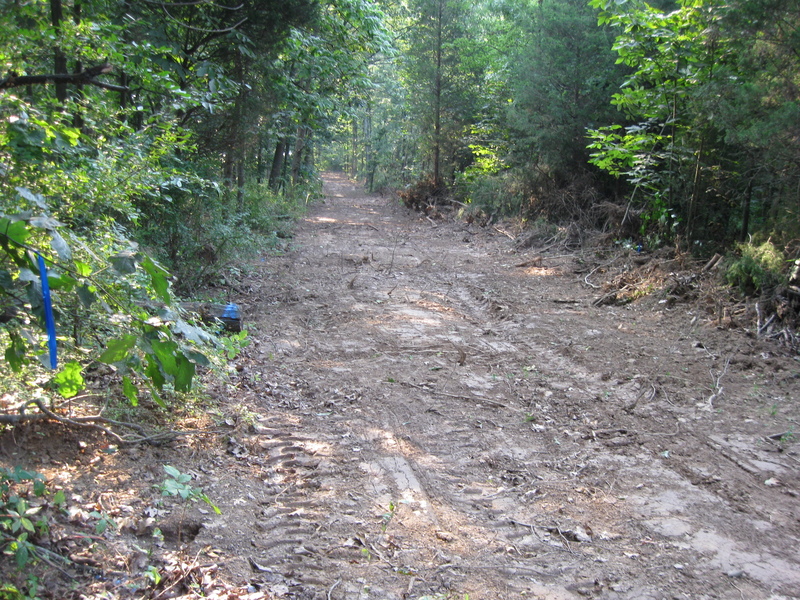 Horse Trail Construction Near South Confederate Avenue on August 14, 2009. 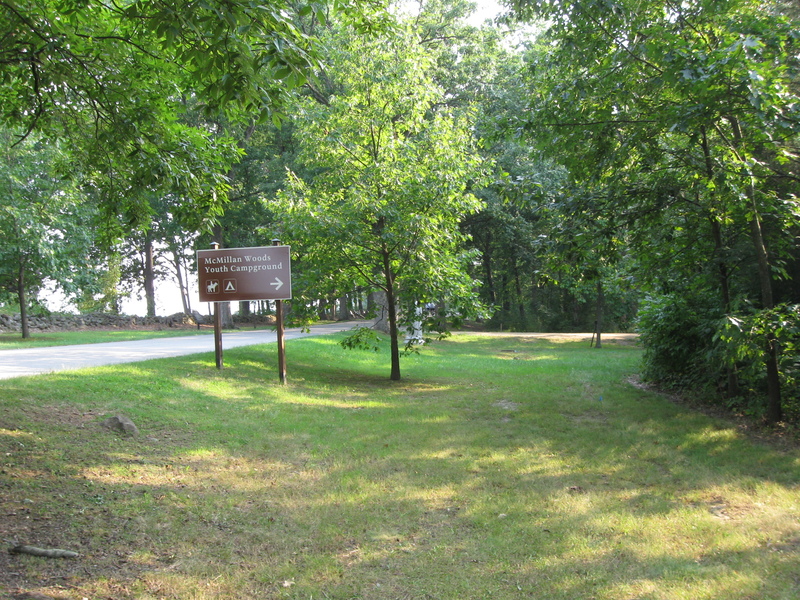 “We Don’t Think the Park Service Wants You to Take Pictures Here on May 13, 2009. And the Nomination for Most Thorough Burying of a Flank Marker Goes to… on November 14, 2008. 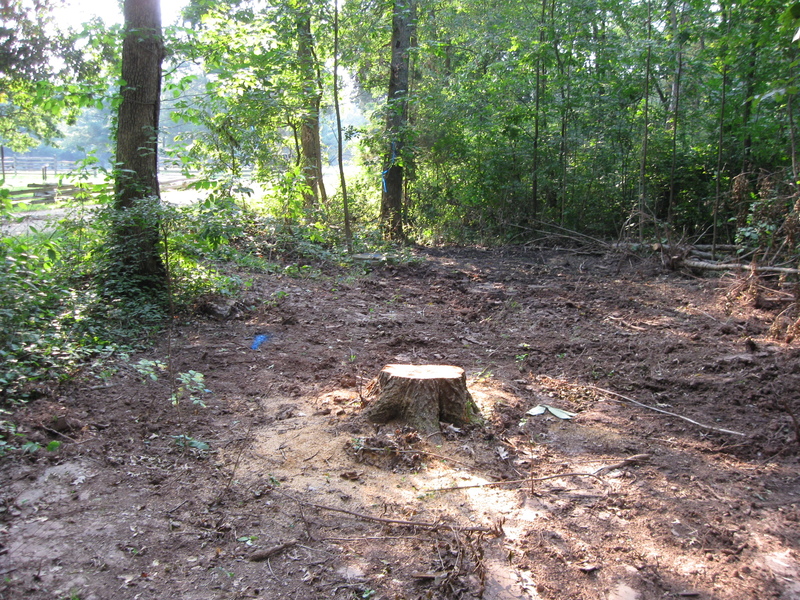 Patterson Farm Tree Cutting and the left flank marker of Knap’s Pennsylvania Battery thrown in a pile behind the NPS Maintenance Buildings on November 9, 2008. 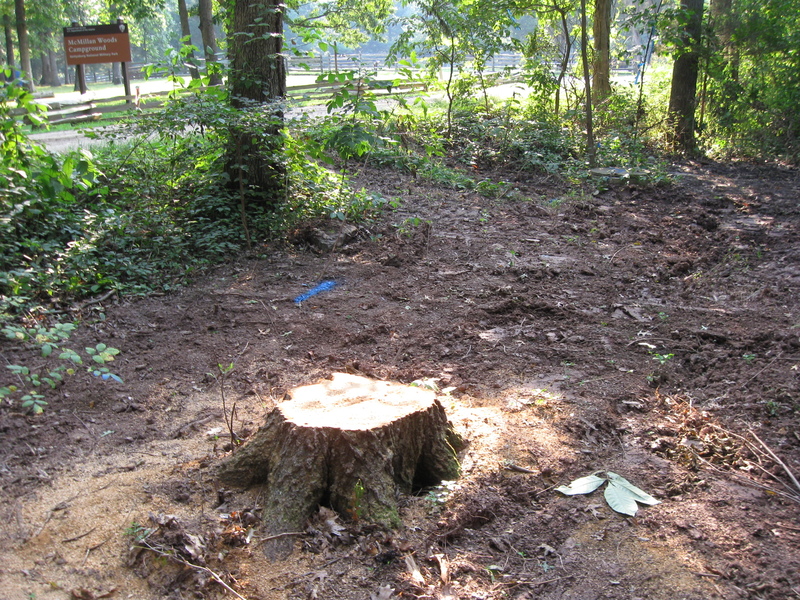 National Park Service Does Move Flank Markers on October 23, 2008. 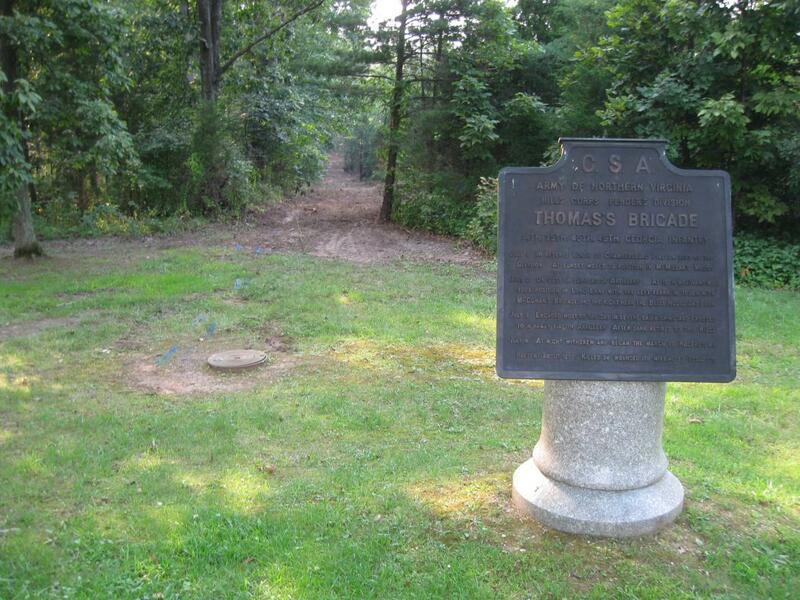 National Park Service decision not to move the Reynolds Avenue flank markers on October 22, 2008. “Do the Flank Markers on Reynolds Avenue Need to be Moved?” on October 16, 2008. 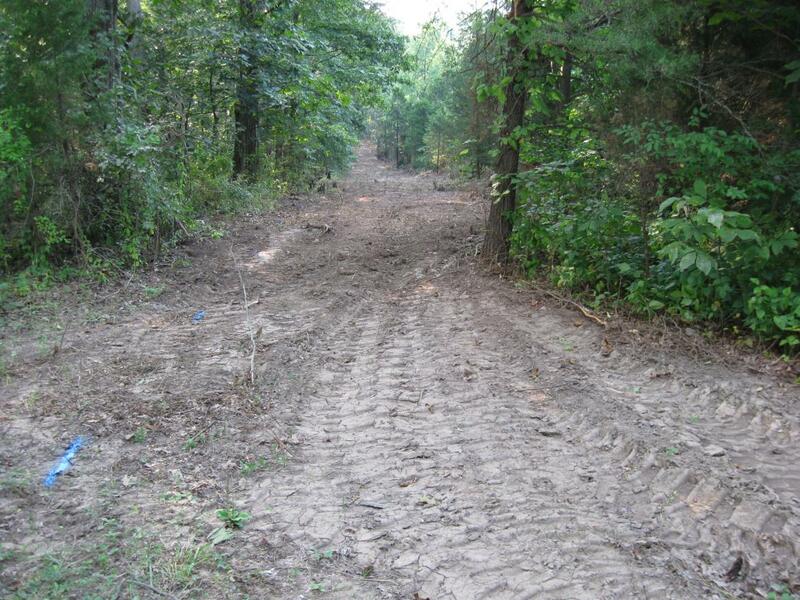 Dirt and Gravel Return to the Flank Markers on October 15, 2008. 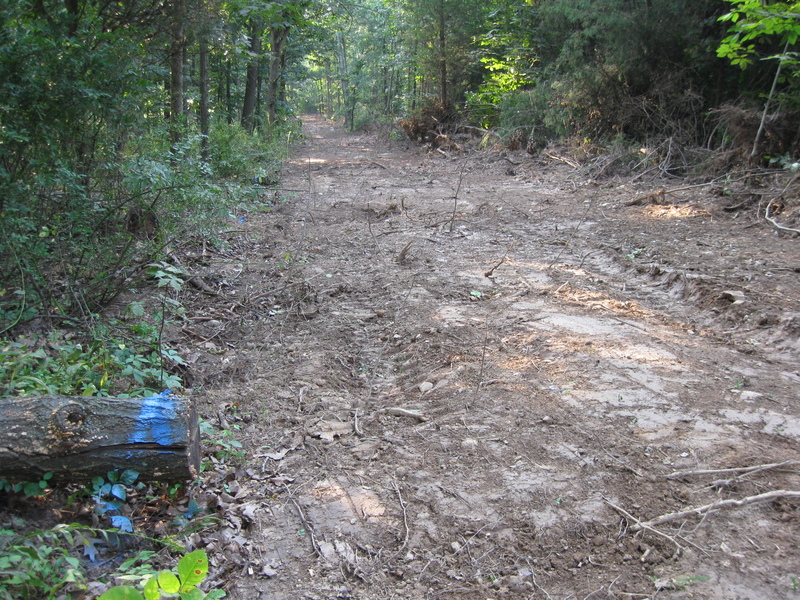 Dirt and Gravel Removed from the Flank Markers on October 10, 2008. 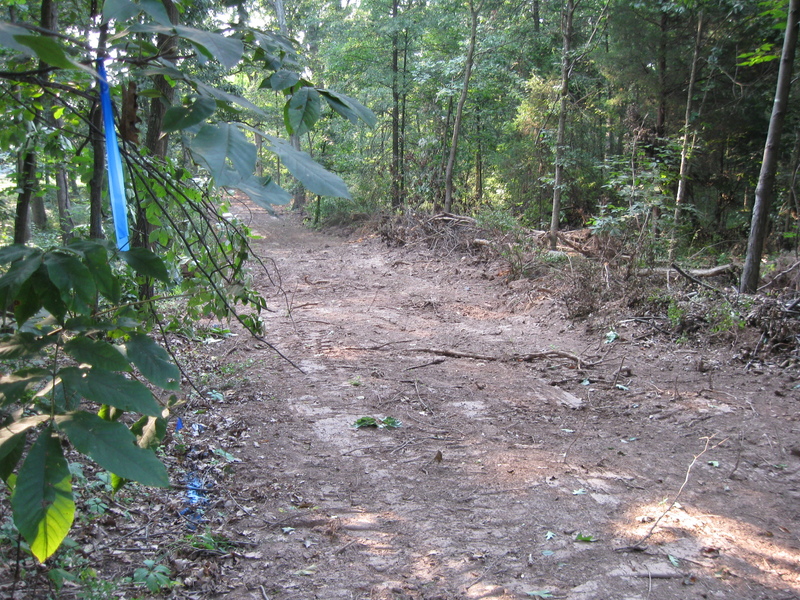 Dirt and Gravel Burying the Flank Markers on October 9, 2008. Doubleday Avenue Roadwork on October 1, 2008. 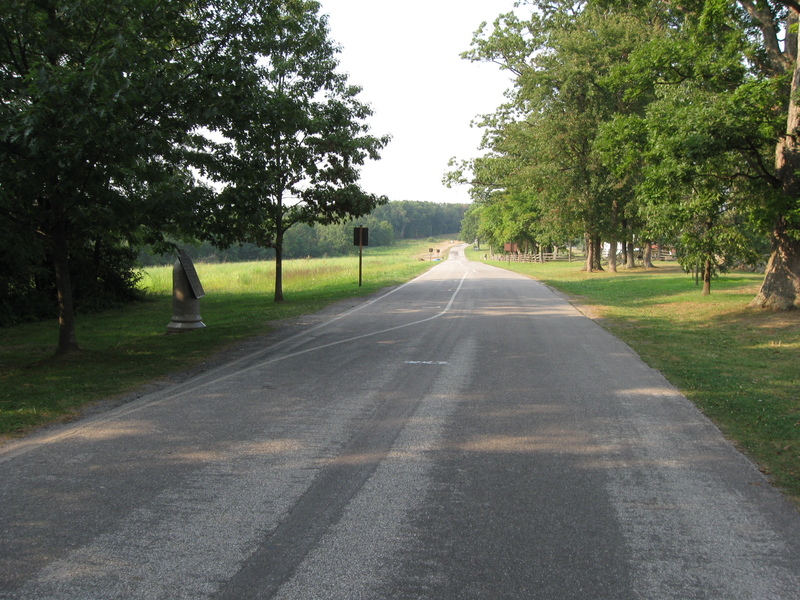 Asphalt Touches the Flank Marker of the 147th New York on September 30, 2008. Contractors trying to cover up their mistake of having asphalt touch boulders in The Loop on September 22, 2008. 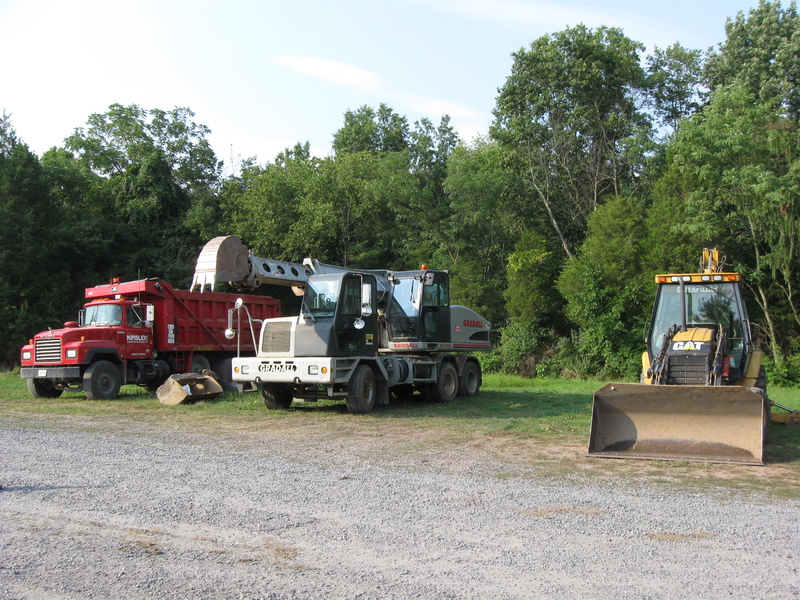 Slathering the Loop With Asphalt on September 13, 2008. 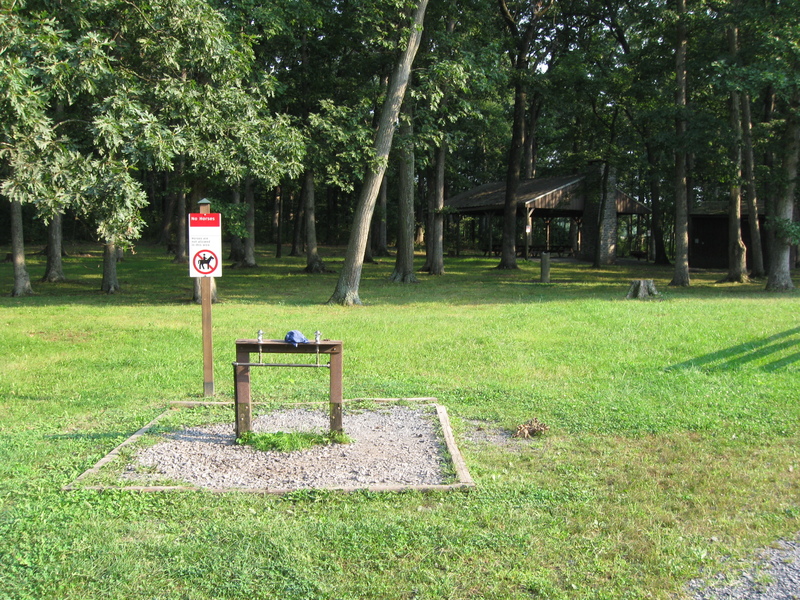 Devil’s Den: Aftermath of the Construction on September 11, 2008.